Did you know that June 19th - 25th was Pollinator Week? We got to participate by building our own Bee House. · There are 4,000 bee species in the U.S. alone! There are 450 species in New York State alone! · To produce 150 pounds of honey, bees cover a distance equal to 13 trips to the moon and back. · Not only are bees great pollinators, but so are butterflies. · The health of honey bees is important to all of us. o In the United States, one-third of all agricultural output depends on pollinators. That means the choices in food to put on our plates would change radically without bees. o The potential economic impacts could be devastating for beekeepers, growers, and producers whose income is linked to the health of honey bees. · The USDA estimated that crops dependent on pollination are worth more than $10 billion per year. · Each state has a state apiarist that works with beekeepers and others on topics of honey bee health. If you want help contacting yours, let us know and we will point you in the right direction! Not only do pollinators affect our economy, they also affect our food and our garden! · Honey bees visit five million flowers to make one pint of honey. · Approximately 1 in 3 bites of the food we eat every day relies on honey bee pollination services to some degree. · Global food supply is impacted due to the extensive role that honey bees play in North American agriculture, one of the largest food exporting regions of the world. · A loss of biodiversity can have serious implications throughout the agricultural ecosystem. · Hosting Mason Bees in your garden can help plants such as garden plants, apples, berries, alfalfa seeds, and melons grow more efficiently. · Of the 1,400 crop plants grown around the world, i.e., those that produce all our food and plant-based industrial products, almost 80% require pollination. Disclosure: This is a sponsored post. All materials were provided my Monsanto Company. All opinions are 100% my own. Disclosure: This is a sponsored post. I will receive compensation in exchange for this post, all opinions are 100% mine. Enter the #AllAmericanHoliday Sweepstakes for a chance to win Great Prizes! Fourteen American companies across the country who are committed to making quality products in the USA have teamed up for an #AllAmericanHoliday sweepstakes. It’s your chance to win up to $7,000 worth of American-made goodies and gear! • All-American Style totaling $1,200 and includes a stack of bangles from Boubon and Boweties, Anti-Aging Light Therapy Device from Baby Quasar, Hayden Reis Ditty Tote, Dune Jewelry $100 gift card, LeatherHead Lemon Ball Baseball, Ebbets cap, coaster set, and an assortment of Tervis drinkware products. Disclosure: This is sponsored post on behalf of Westfield Malls. I will receive compensation in exchange for this post. All opinions are 100% my own. Ho! Ho! Ho! Santa and Mrs. Claus have arrived ! While his elves are hard at work back at the North Pole prepping for the big day, Santa and Mrs. Claus are waiting for you to visit and say hello as well as capture your memorable moment. Christmas Eve: 10am-5pm; with reindeer break between 1pm-2pm. 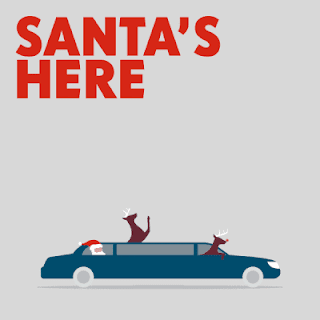 Visit Westfield.com/holiday for details on how to skip the Santa line! Mommy & Me Day With Santa and Mrs. Claus And Their Reindeer! You can also support St. Jude Children’s Research Hospital during the Mommy and Me with Santa and Mrs. Claus event on Saturday, December 3rd at 11am. The event will feature interactive activities including arts and crafts, gingerbread cookie decorating, story time, and a special meet and greet with Santa’s reindeer! Reindeer are magical and on a special diet, so we can’t pet or feed them. ***Personal cameras are permitted. Space is limited and advanced purchase tickets are required. Purchase your ticket HERE. All proceeds benefit St. Jude Children’s Research Hospital. Don't have little ones to visit Santa? Bring your furry friends for a special night with Santa on Sunday evenings November 27th and December 11th from 6:30pm-8:30pm. The first 50 pet parents receive a stocking stuffed with treats for their beloved family member. Check out my post about Westfield Early Shopping and also enter to win a $100 Shopping Spree HERE. Disclosure: This is a sponsored post on behalf of Westfield Malls. I will receive compensation in exchange for this post. All opinions are 100% my own. The Holidays will be upon us sooner than you think. Now is the time to start your shopping while there are still open spots in the parking lots and small lines at the checkouts. Westfield Shopping Centers are celebrating early shopping for the Holidays with tons of discounts and festivities. Not sure what to get for everyone on your list? Make sure to visit Westfield.com/holiday for the Westfield Holiday Gift Guide that will cover anyone on your list. Naughty? Nice? No matter. To keep you organized through your shopping trips, I suggest making a list of everyone you need to buy for and setting a budget for each person. Once you have an idea of what you want to buy, look for discounts at your favorite stores. My favorite way to get discounts is through the Westfield app. I've saved at multiple stores using the app. It's so easy to use and you can check about special events too. Speaking of special events. There’s always something fun happening at your local Westfield Shopping Mall! Be surprised and delighted by the **Merry Makers** as they bring moments of holiday cheer to shoppers November 20-27. Merry Makers is such an awesome idea, I can't wait to visit my local Westfield Mall next week. **Merry Makers** : The Merry Makers will be decked out in holiday plaid tidings (male and female), and will be very engaged with shoppers. They are meant to be a “surprise and delight” addition to the shopping experience. Think of them as roaming entertainment. They will randomly buy gifts for guests, surprise them with candy or coffee, carry guest packages, etc. They will also be entertaining with random holiday singing and dances. If you encounter the Merry Makers, make sure to share your stories. I'd love to hear about everyone's experiences! Find your local Westfield mall at Westfield Brandon, Westfield Citrus Park and Westfield Countryside or visit Westfield.com for a full list of centers. Disclosure: This post is sponsored by Slammers Snacks. I did not receive any compensation for this post. Giveaway prize is provided by sponsor. With Halloween around the corners, kids are excitedly planning their outfits and obsessively mapping out routes that include houses giving out king sized candy bars. But instead of super-sized Candy, why not sneak in a sweet, all natural, superfood snack? After all, diabetes and obesity are on the rise among kids. 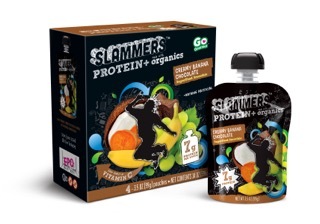 Slammers Snacks are tasty, superfood snacks designed to fuel kids with organic fruits and vegetables. Not only are they a healthy alternative to sugar-laden candies and other franken-foods that pop up around this time of year, but they fun, crumb-free snacks that introduce kids to fruits such as mangoes, acai, yumberries, and pomegranates. They serve as a great source of essential vitamins, and some flavors, including Creamy Banana Chocolate (our newest, with the least amount of sugar!) come packed with seven grams of protein. To help you prepare for Halloween One lucky reader will win a case -24 pouches- of the New Creamy Banana Chocolate flavor Slammers. (About $36 Value). Westfield is helping you keep the kids entertained this summer! In partnership with Mattel Inc. they invites families to be a part of their fun-filled Family Summer Series program. Families can enjoy live entertainment and meet & greets from their favorite characters. You will be able to also enjoy special offers and meal deals from participating stores and restaurants. 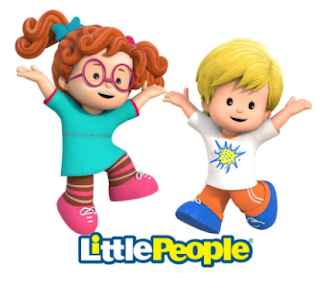 Eddie and Sofie from Little People will share their favorite hobbies with everyone. There will be singing, dancing and families can enjoy interactive games, prizes and crafts! Join Barbie for a doll-tastic day as she teaches kids that they can do anything! She will entertain everyone with new songs, interactive games, prizes and crafts. Families will be able to pose for photos with their favorite characters during the events. Check the events page of your closest Westfield Mall location for more details. Disclosure: I was invited to experience a bloggers experience at one of the series events. All opinions are 100% my own. With Soccer season in full swing, I was very happy to have a chance to try the New Purex plus Clorox 2 with Stain Fighting Enzymes. I have four kids in Soccer right now, so you can imagine the amount of dirty clothes I get after games and practices. 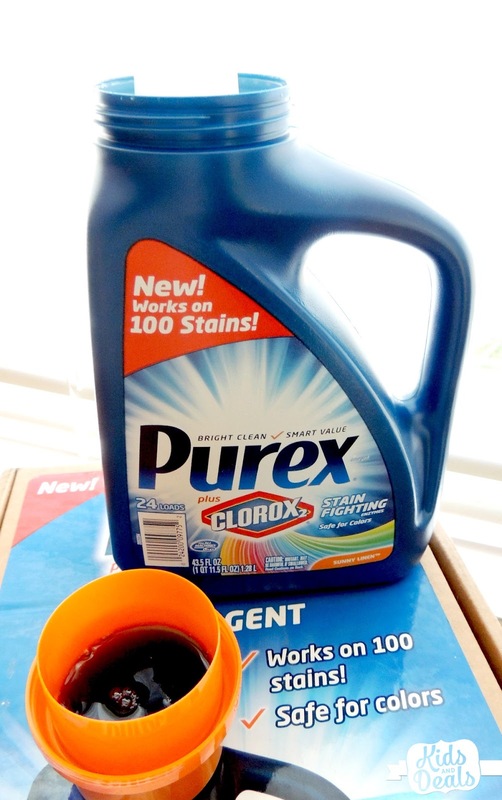 The New Purex plus Clorox 2 states that it removes protein-based stains like grass and blood and I had a challenge for it. I used it on all the soccer clothes and I very pleased to see that they all came out of the laundry looking like new. 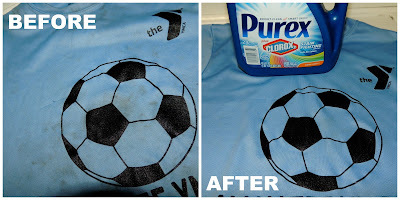 My boys are going to Summer Camp in a month, and I'm ready tackle those stains! Find it at your local retailer or online. For a detailed list see HERE. 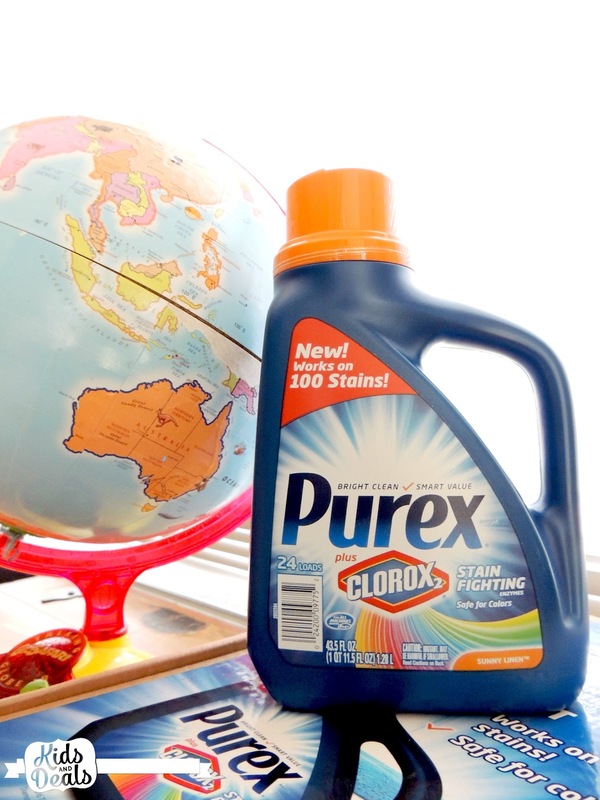 Disclusure: The Purex Brand provided me with a sample of Purex plus Clorox 2 detergent in exchange for a product review. However, all the opinions expressed here are my own. I received a superkind set in exchange for this review. All opinions are 100% mine. 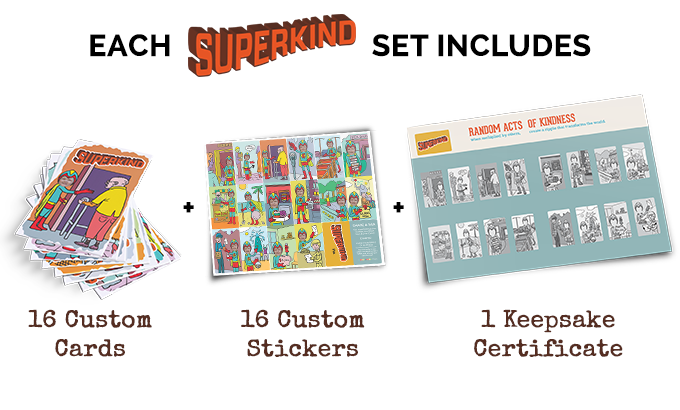 SuperKind is such a beautiful concept that I feel honored to have the chance to share it with all of you. The founders of Datevitation and their daughter decided to take a stand against bullying and encourage kindness instead. Superkind is a fun product that will help inspire kids to perform random acts of kindness. 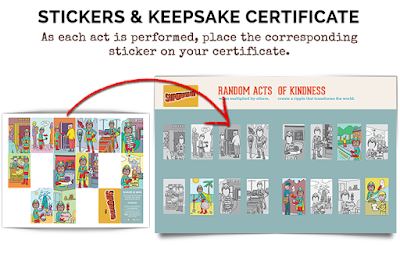 They will be able to track their RAOK with personalized stickers, and encourage their friends to do the same by handing out cards featuring their faces. 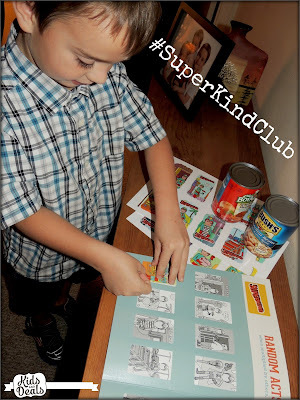 The goal is to inspire a new generation of everyday heroes who unite the world with the power of kindness. Elijah loved receiving his personalized kit. The first RAOK he picked was donate to the local food shelter. 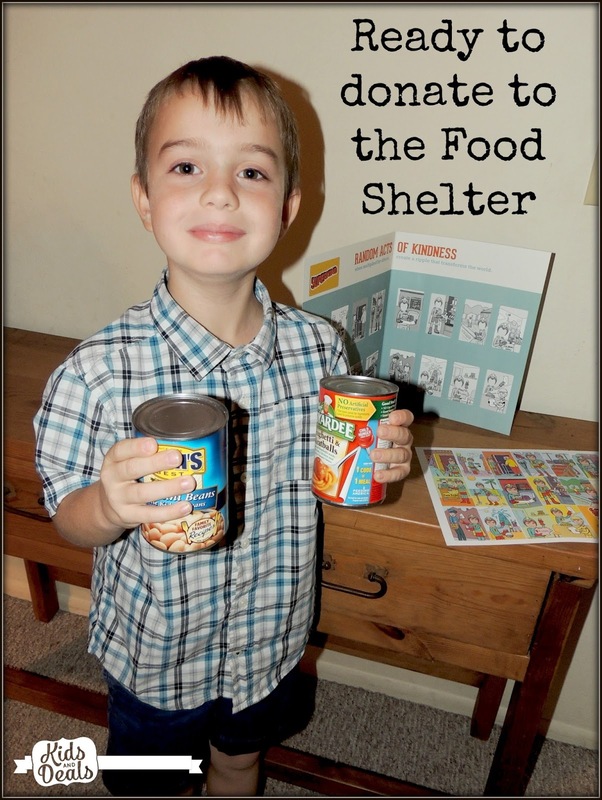 His school is collecting cans all month, so he took two cans with him to donate. He was very proud to put the food donation sticker on his certificate! Next, he encouraged his sister to do a RAOK as well. The cards are really cute, and give ideas as to what RAOK to do. 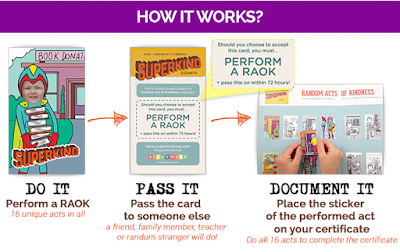 Before going to school Elijah decided he was going to do another RAOK during the day. He was very proud of himself for letting his friend in front of him while waiting in line. 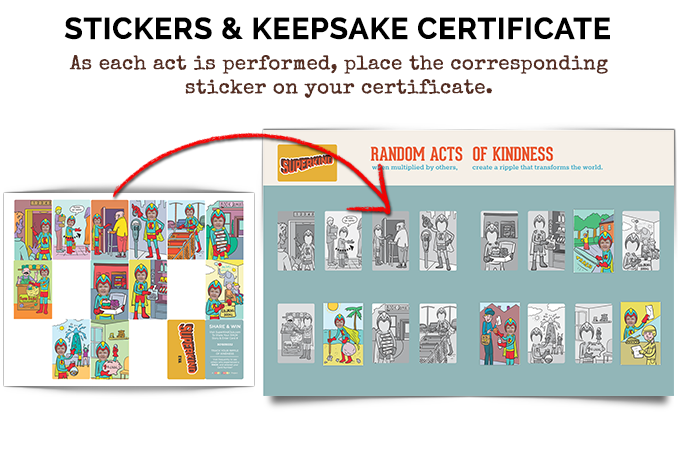 He got to put another sticker on his certificate, and we're preparing for our next RAOK, which will be to leave a treat for the mailman. I love the concept of SuperKind and encourage you to check out their Kickstarter Page HERE. 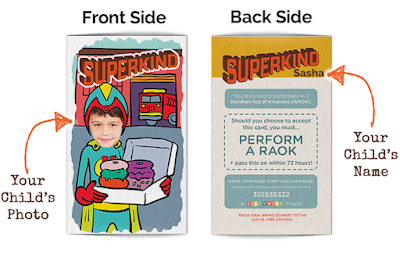 Download the Kit Free: They want all kids to have access to SuperKind cards, regardless of their financial ability. 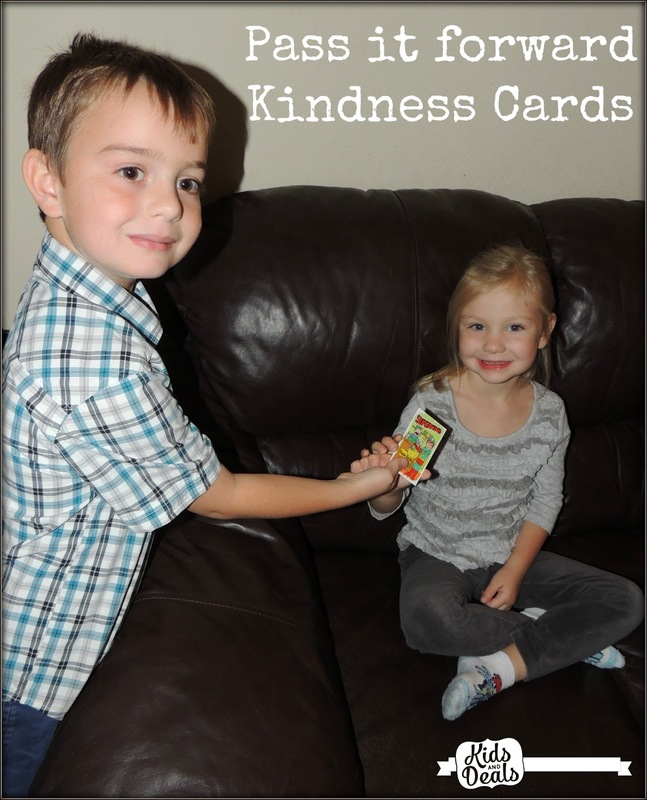 That’s why they are offering a free PDF download of the Kindness cards for anyone who shares their campaign.